THE DAY THE DOLLAR DIED is being called the most important book on Bible prophecy since "The Late Great Planet Earth." Learn about the hidden agenda behind the financial meltdown. Find out why the financial crisis is not an accident but an intentional plan to bring in a one world economic system and world government. Read about how the Council on Foreign Relations had a rehearsal for a global financial meltdown in the year 2000. Right now people are meeting to re-write the Constitution of the United States. Why? Because in order for a United Nations, European Union or North American Union Constitution to be implemented the original U.S. Constitution must go. Our Founding Fathers understood that life, liberty and the pursuit of happiness were inalienable rights that came from the Creator. In the new global constitution, rights will come from the World Government. We will no longer be "one nation under God," but "one world under man!" But there are practical things you can do to save our nation and change our world. All of a sudden the real state bubble began to burst. Consumers who bought homes they could not afford through "tricky loans" could not continue to make higher payments when their Adjustable Rate Mortgages went up. The real estate bubble exploded as hedge fund investors began to lose billions of dollars. A global financial meltdown is underway. For the first time in history, a Republican President and the U.S. government, as well as governments around the world began to buy up or nationalize banks, insurance companies and corporations in a frenzied effort to keep the world financial system from collapsing. In Paul's new ground breaking book, "The Day The Dollar Died,' he exposes the truth about what is really happening. None of the financial analysts with the international banks and investment firms, with their sophisticated computer analysis and projections knew this was coming. Do you really believe that? Paul answers the question about whether or not this was a planned event and for what purpose. World leaders are crying out for a new global regulatory system and a one world currency. 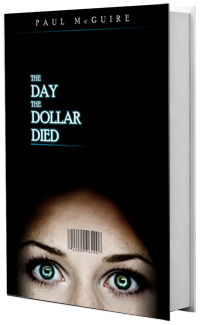 "The Day The Dollar Died" uncovers the truth about a one world economic system, a cashless society and a microchip implant. Paul traces the history of what really happened in the The Great Depression of 1929. Our Founding Father's warned us about the creation of what was called a Central Bank that would control our money supply. In 1918 we mysteriously got a Central Bank under the name of the Federal Reserve System. Who was behind the creation of the Federal Reserve System and how are those same forces at work today? Did the international bankers really finance the Communist Revolution, Adolph Hitler, and the Chinese Communist Revolution? Why did these same groups finance America, France and England as well? What is the Hegelian Dialectic and how is it at work today transforming our nation and world? George Bush, Sr. talked about the creation of a "new world order." It became taboo to use that word in the media for over a decade. But Henry Kissinger recently said that President Barack Obama can now bring about this "new world order." Why were the same financial interests that put George W. Bush into power also the same interests that put President Obama into power? Who really controls America and the world? Why does the media say almost nothing about the most powerful organization in America - The Council On Foreign Relations? Why is the goal of the Communist Party, the Humanist Manifesto and the United Nations the same? Their goal is a world socialist government and one world economic system and to microchip the population. What will this one world economic system and one world government mean to your Constitutional freedoms such as "Freedom of Speech," "Freedom of Religion" and "Freedom of the Press?" Why is their an aggressive plan underway to radically change our Constitution and bring in a new North American Union Constitution or World Government Constitution? China will become the most powerful economy in the world in less than ten years. Did that just happen by accident or did it start with secret visits from former President Richard Nixon and Henry Kissinger? Why do powerful political leaders keep saying openly that the ideal government would be a "synthesis" of the Communist Chinese Government and the U.S. Government? The League of Nations failed to bring about world government in 1919. The men and organizations behind this move towards world government learned that they could not bring in global government without the help of the Christians in America. Certain wealthy men and organizations began to pour millions of dollars into churches, ministers and denominations in order to create a new "social gospel" that could be used to bring in a United Nations government. These men met with over 30 denominations and infiltrated churches, denominations and ministers who would transform the Gospel of Jesus Christ into a a humanistic social gospel. Are those powerful groups still operating today and are they funding certain denominations, churches and ministers? In the late 1800's a group of British intellectuals called the Fabian Socialists developed a comprehensive plan to usher in a world socialist government. The science fiction writer H.G. Wells wrote "War of the Worlds" and "The Invisible Man." But Wells also wrote books like "The Shape of Things to Come" and "New World Order." These books talked about the importance of using "crisis" and "perpetual war" to persuade people to accept a world socialist government. In the same way computer technology and biotechnology have made incredible progress in the last two decades. There is also another technology that has made incredible advancements. These technologies have been hinted at in popular movies like "The Bourne Identity" and "The Manchurian Candidate." It is now possible to program entire nations like in the "Manchurian Candidate" without the masses recognizing that their belief systems have been programmed. This is just the tip of the iceberg! "The Day The Dollar Died" uncovers an "Open Conspiracy" to transform the world and America in a radical way in the next few years. These radical changes are going to affect every aspect of your life! The standard of living for the American Middle Class, your Constitutional freedoms, the opportunities you and your children will have, and the American dream. We are very close to entering a period of what Paul call's "total lockdown." You have been given one last chance to change your fate and the fate of America!